Sewer problems are high on the list of a homeowner’s worst nightmares. After all, it costs a lot of time, energy, and money to get your sewer repaired, not to mention the fact that sometimes you have to go without water in your Granbury, TX home for a few days. If you need a sewer repair or you think you might, call us at Lightfoot. We work hard so you don’t have to stress so much. We’ll get you a quote for the repair that you need, talk to your homeowner’s insurance company if that’s necessary, and help you get everything fixed. We know you can’t live without your sewer, and we’ll work hard to get your life back to normal. Many homeowners aren’t aware of common sewer problems. If you’re having any of the issues outlined below, or you are having other unusual plumbing problems, call us up. We’ll come out, take a look, and let you know if you need a sewer repair. Green, green grass. If your grass is extra green, and especially if it’s extra green in just a couple of places, it’s likely you have a sewer leak. After all sewage is great for plant growth! If your yard is growing well and there’s not another explanation, it’s time to check your sewer. A bad smell…inside or out. Unfortunately, sewage smells terrible. If you have that smell inside your home, you’ll definitely notice. But you should call us even if you smell sewer smells wafting around outside your house. If sewage is leaking into your yard, you’ll smell it eventually! Unusual plumbing issues. If you toilet overflows every time the dishwasher drains, it’s time to look at your sewer. 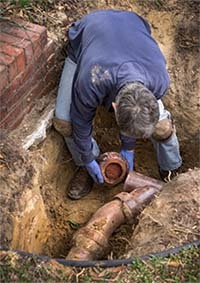 Any plumbing problems that seem to connect one area of your house to another probably have to do with the sewer line. Repeated plumbing problems. Have you had a plumber out more than twice in the last six months? If you continue having problems, it’s time to check your sewer. Sewers that need repair will continue to give you issues until you get them fixed. Simultaneous clogging across your home. Are there times when it seems like none of your plumbing is working as it should? Then it’s time to check your sewer. Since all of your drains eventually feed into the sewer, having them all back up likely means that the problem originates with that line. We’ll look into it for you and let you know what we find. Call in the best! Call Lightfoot! We’ll work with you to make your sewer repair as convenient as possible, and we won’t leave until you’re satisfied with our work. Our plumbers love to leave happy customers behind, so they will be polite, helpful, and ready to answer any questions you might have. When your sewer needs repair in Granbury, Lightfoot is the one to call. Simply Mention This Special When you Call!